February is bingo month at RYB! Throughout the month of February, collect stamps on the bingo cards available at the front desk — simply by coming to class! Once you get a bingo, you will be entered to win a great prize! If you fill your entire card, you will be entered to win a three-class package! Two winners will be drawn. If you fill the four corners, you will be entered to win a RYB clothing item of your choice. Two winners will be drawn. 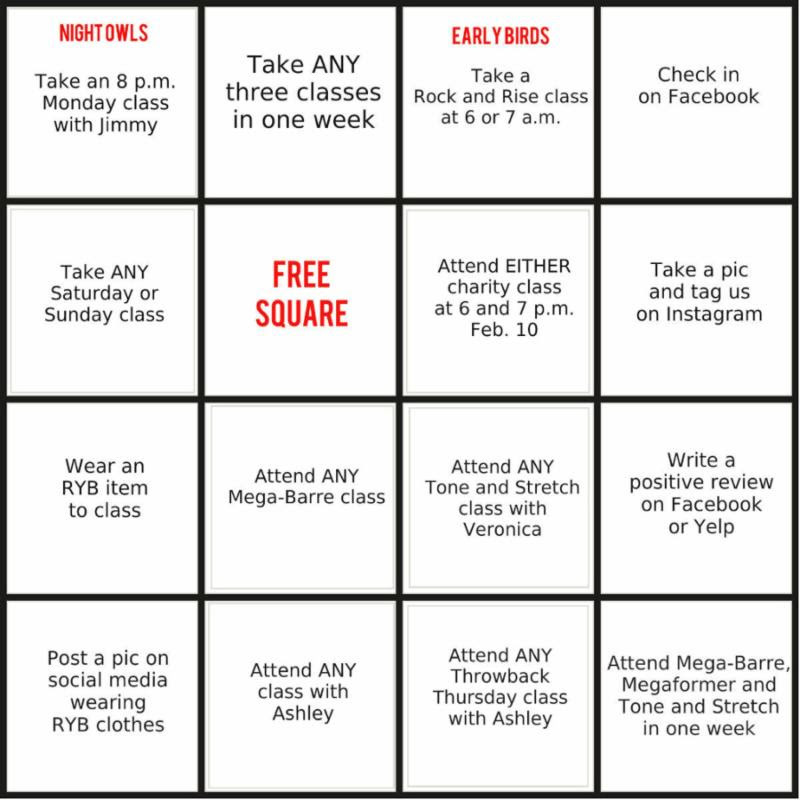 If you get a bingo horizontally, vertically or diagonally, you will be entered to win a free class! Four winners will be drawn. You may only get one bingo stamp a day. You can get any bingo and still work toward getting your card filled! There are many opportunities to enter different drawings! Contest runs Feb. 1-28, 2017. Winners will be announced March 1. Bingo cards can be picked up at the front desk, and stamps will be given by staff. If you participate in a social media square, you must present it to a staff member to receive a stamp. Have fun, and good luck, RYBers!